My first proper Challenge Walk and probably my favourite. This is the walk that everyone of "the Boys" and my family, including Anne, has done at least once. The first time, Ray, Peter, Larry and I, accompanied by his son Greg, did it was in 1994. It was a very hot day and, although like after most challenge walks I said "never again" I was back the following year, this time accompanied by Greg, my younger son Ian and friend Alan. This is the report of that walk. The White Peak Walk 1995. 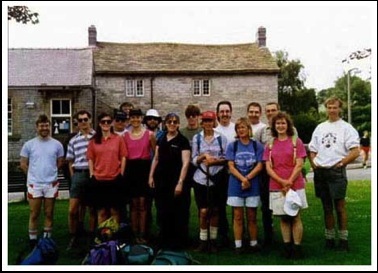 Saturday, 8th July 1995 was a special day in Monyash, and a special day for approximately 240 people who descended on this Peak District village for the 10th White Peak Walk. Having completed the walk with my eldest son Greg the previous year I had persuaded my youngest son Ian, Greg and one of my friends, Alan, to have a go in 1995. So at 9.45 a.m. Alan, my sons along with the rest of the 240 - there should have been 300 but obviously some had decided not to turn up - were congregating on and around the village green for the 10 o'clock start and a long days walking. 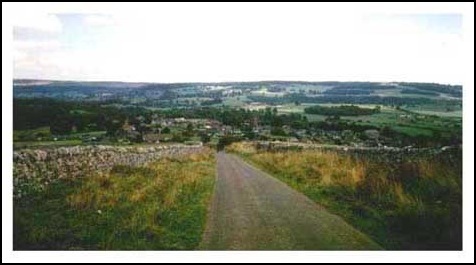 The White Peak Walk, which is organized by Monyash Residents with all profits going to local charities, is a "stroll" of approximately 26 miles and an estimated total ascent of some 3,500 feet through some of the most beautiful scenery in Derbyshire. Although there are prizes for the fastest man, woman and veterans of both sexes it is not a contest, or if it is it's one where walkers try to improve on last year's time rather than beating other walkers. So there we all were in Monyash, renewing friendships with walkers we had met last year, saying hallo to work colleagues who like me had driven up from Warwickshire that morning, or in some cases the night before to take advantage of the local hostelries in and around Monyash or nearby Bakewell. Chatting away happily in the sunshine, checking boot laces for hopefully the last time and ensuring rucsacs are comfortable when suddenly it's time to go. "Runners to go down the lane and immediately turn of left, walkers to walk down the lane for approximately a quarter of a mile and then turn of left". The starter having given his final instructions fires his gun and we're on our way. This is the most crowded part of the walk. All these walkers moving briskly down a lane would be quite a shock to a motorist or a walker coming the other way. However soon we turn off left up a pathway to the first stile. We will see plenty of these before the walk is finished and from memories of last years "marathon" I know they will get more difficult to clamber over. Last year, to make this initial stile easier to navigate, bales of straw were placed there the night before to make steps. Unfortunately, however some bright spark, or sparks, decided that they would burn well, which they did, so rather than straw steps and a quick passage over the first obstacle it was a clamber over a charred stile. Although this was not difficult so early in the walk it did result in a minor queuing problem, but gave everyone a chance to catch their breath and consider what they have let themselves in for particularly as it was now getting very warm. It was going to be a very hot day. The first check point is at the Waterloo Hotel, which is on the A6 just west of Taddington and also on the Limestone Way that we had followed northwards since leaving Monyash. All walkers are issued with cards that are marked at each of the 8 check points. Also a note is made of the walkers number so at any time the organizers have a good idea where all the walkers are. This is all done with the help of REVCOM, which provides radio communications between check points and the base at Monyash. Although I am not aware of any one getting totally lost it is not unusual for some to take the wrong turn. However, as walkers can take whatever legal route they wish between check points they may blame their miscalculations on looking for a better route or going on a scenic detour. None of us ever seem to get lost! From the Waterloo Hotel the route crosses the A6, goes north eastwards for about half a mile before turning east towards the second check point at Brushfield. From here we continue eastwards picking up the Monsal Trail at the Monsal Head Viaduct. 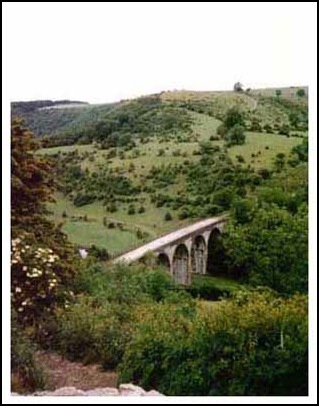 By the time we reach the Viaduct we are ready for a short break; an opportunity to view the splendor of the location, before the short steep climb to the top of Monsal Head. Here some walkers may succumb to a drink at the Monsal Head Hostelry. I do consider this but like the vast majority of the walkers I realize that there is still a very long way to go and alcoholic refreshment now would not be very beneficial. So it's farewell to Monsal Head and on to Little Longstone before picking up the disused Railway Line from Buxton, the Monsal Trail, which we follow most the way to Bakewell. By the time we reach the Bakewell Check Point, which is situated on the north bank of the River Wye to the west of the main river bridge into Bakewell, it is 1.30 p.m. We've completed about 11 miles. Only another 15 to go! The next couple of miles I always consider the worse section. Like many walkers I seem to be able to tramp for miles on the flat or up or down providing the terrain is not full of potholes, or littered with rocks and logs to clamber over etc. Terrain like this destroys your rhythm and is hard work. The next check point is Carlton Lees but to get there it's uphill over the Golf Course to the north east of Bakewell and more uphill work along a broken path through a small wood. This is my least favorite part. It's now very hot, the walking is difficult as the path is narrow and uneven and flies are attacking us. But onwards we must go and it is a relief to finally come out of the wood and to be free of the flies and the ruts. We are now at Carlton Pastures and it's an opportunity to have a little rest before we continue. But where's Alan? We wait 5 minutes but he's not in sight. We are beginning to wonder whether the woods, ruts and flies were too much for him and if he's returned to the Bakewell Check Point to get a lift back to Monyash. Where is he? When we are more or less convinced that he's "called it a day" he appears from the trees. Unlike my two sons and myself, who are probably the walkers equivalent to whippets, Alan is a heavy weight. 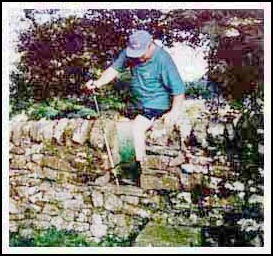 He's always had a slight weight problem and with a height of 5"10" and weighing about 16 stone it was inevitable that the walk from Bakewell to Carlton Pastures would be a struggle. But he's made it, although he has me worried. He's very red in the face and I'm wondering if he is going to collapse but he assures me he always goes red when he's hot. So we wait a few minutes for his complexion to go paler and it's rucsacs back on and downhill to Carlton Lees which we reach at about a quarter to three and the good news is we are now over half way. We're a little bit behind our anticipated schedule but the important thing is we should all finish. The next 2 miles is probably the flattest part of the walk and our path takes us along the River Derwent on our way to our next check point at Rowsley. Here, at Rowsley, besides the water and squash to drink, which is available at all the check points, there is tea. Now I'm not a great tea drinker but a cup of tea at Rowsley on a hot summer's day with 16 miles behind you is nectar. But we can't stop long. We must go on. By now Alan is flagging. His feet are aching and we are slowing down. Because of this, rather than go to the next check point in Birchover via Stanton Moor we decide to go via Stanton Lees and walk along the lanes. By now all of us are finding our rucsacs are feeling heavier than when we started. The conditions of entry require all competitors to carry either the 1:25000 or the 1:50000 ordnance survey map of the area, "suitable equipment and clothing to ensure safety for the duration of the walk", food for consumption on route and a first aid kit. My downfall is the "suitable equipment " . Maybe I'm too much of a pessimist and think however nice the day is it could get cold and wet. Greg has decided to bring a pair of "trainers" in case his 4 season, suitable for Crib Goch, walking boots get too heavy for his feet, which they do but unfortunately they feel even heavier in his rucsac. Ian collects baseball hats. We hope he will get over it but in the meantime every mile or so his current headwear is changed. Alan's wife thought he might get hungry and so we know what's weighing his rucsac down! So with this weight on our shoulders we trudge in the afternoon sun to the next check point. More drinks are downed and, with us all now wearing headgear to escape the sun's rays, it's on through Birchover, which is crowded as it is the village's gardens annual open day. What we see of the gardens look very nice, but we can't stop and admire. We leave Birchover going west to meet the Limestone Way at the bottom of Robin Hood's Stride - I always thought a stride was the same as a step but it seems in these parts it's another name for a hill. By now Alan is really slowing down but not because of lack of energy, or food, but because he collected a blister a few miles back and it is now "letting him know about it". However, we are now only about half a mile from the Harthill Moor Check Point so, as my ability to deal with blisters is not good, I go on ahead to Harthill Moor to see if they have a first aider there. They haven't but one of the marshals has some first aid knowledge and the equipment, which he gets out in readiness for Alan's arrival. And I'm in luck. They have got the kettle on so I sit down with a cup of tea and wait for Alan and boys to arrive. I won't go into the detail of Alan's feet too much except to say he has got a king size blister which helps to explain why a slightly over weight, nearly 40 year old is having trouble keeping up with a 50 year old. Ian, Greg and myself are all wondering if he will be able to continue. Alan himself is not sure. But while the "nurse" is fixing a very unpleasant looking heel Alan sits back with a cup of tea and enjoys a rest, decides he'll rest longer and that we should go on without him. But will he continue the walk? He's not sure but he will decide when he's finished his tea and "Florence Nightingale" has repaired his foot. It's now just gone 4.45 p.m. and we have seven more miles to do. Greg and I will be lucky to get inside last year's time but we decide to go for it. We continue along the Limestone Way until we reach Youlgreave where the River Bradford looks very inviting and a number of children and adults are enjoying the coolness of a paddle in the clear water. Although we could continue along the Limestone Way all the way back to Monyash, we decide to take the Moor Lane which leads to the Long Rake Car Park, the last check point before journey's end at Monyash. However the aforementioned lane is a good mile long and uphill all the way. But we are still trying to beat last years time and conquer the slope in record time passing some colleagues from Warwickshire on the way. However, my youthful sons by now are "flying" and with the twenty year old in front and his 16 year old brother close behind they soon leave me in their wake and by the time I reached the Long Rake Check Point they are vanishing into the distance. I don't think they even stopped at Long Rake for a drink. I did, but not for long, a quick gulp and I'm away again. I'm now back on the Limestone Trail and twenty minutes later I've passed Calling Low and on my right I can see the start of the beautiful Lathkill Dale and in front like a gash across the landscape is Cales Dale, the "sting in the tail". Like most White Peak Walkers when you reach Cales Dale, you're tired. On a day like today you've had too much sun. 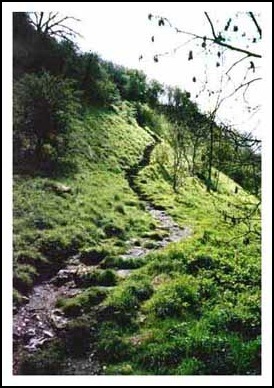 Your legs ache and then you find yourself descending a stairway of polished limestone to the base of the dale. It's not energy saping but it makes your legs ache even more. Am I getting too old for these jaunts? Before I've decided on the answer I've clambered out of the dale and now I'm only a couple of miles from journey's end. It's 6.45 p.m. and I'm just approaching Monyash Churchyard. It looks as if I'll beat 9 hours but if I put a spurt on I could beat last years time. I'm nearly through the Churchyard and once I'm out and on the road I'm only a 100 yards from the Monyash Village Hall which is journey's end. After 26 miles I find myself running down the street and cheered on by spectator and walkers I reach the end. I'm the 117th to finish. My time? 8 hours 50 minutes. I've beaten last year's time by one minute. The boys were 115 and 116 and completed the walk in 8 hours 41 minutes. But what about Alan? Did the blister end his marathon or did he make it? Before I sit down for the traditional White Peak Walk supper of meat pie and mushy peas accompanied by cups of tea I check if Alan has retired. The answer is no and by now unless he is very slow, or stayed a very long time at Harthill Moor, he must have passed Long Rake. He's going to make it. To cheers and applause Alan arrived at journey's end at 7.31 p.m. He'd done it. His time 9 hours and 31 minutes for the 26 miles. Towards the end of August I received in the post official "Walk" results. 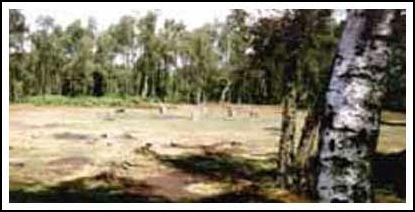 Of the 242 who had started the walk 221 had completed it. The fastest was a Nicholas Sercombe with an amazing time of 3 hours 34 minutes, but I do believe he ran part of the way! The last walker in reached Monyash at 9.24 p.m.
What of next years walk. Greg wasn't sure what he would be doing. Ian said I don't think so or something similar. I wasn't able to contact Alan but I fancied a go again so I sent off my application. A week later Alan phoned. "Hallo Barry. Have you had the official results? Are you going to have a go next year? I've put in my application already". So next year Alan and I were there again and so were Ian and Greg who later both changed their minds. Although I don't think I'll be undertaking the White Peak Walk again, in total I completed the walk 5 times between 1994 and 1999. My slowest time was 9 hours 9 minutes and my quickest 8 hours 22 minutes recorded on the last occasion I did the walk back in 1999. Find out more about the White Peak Walk.